The graphic below is a detailed housing market report that highlights all of the most popular Apple Valley Lake real estate price ranges. Take a really close look at the left side columns because we have broken each price range down so you can see which price ranges are hot. The column to the far right shows how many months of available inventory is currently available in each price range. You can also see each of these columns are highlighted by specific colors and the meaning of each color is described at the bottom of the graph (favors buyers, neutral or favors sellers). 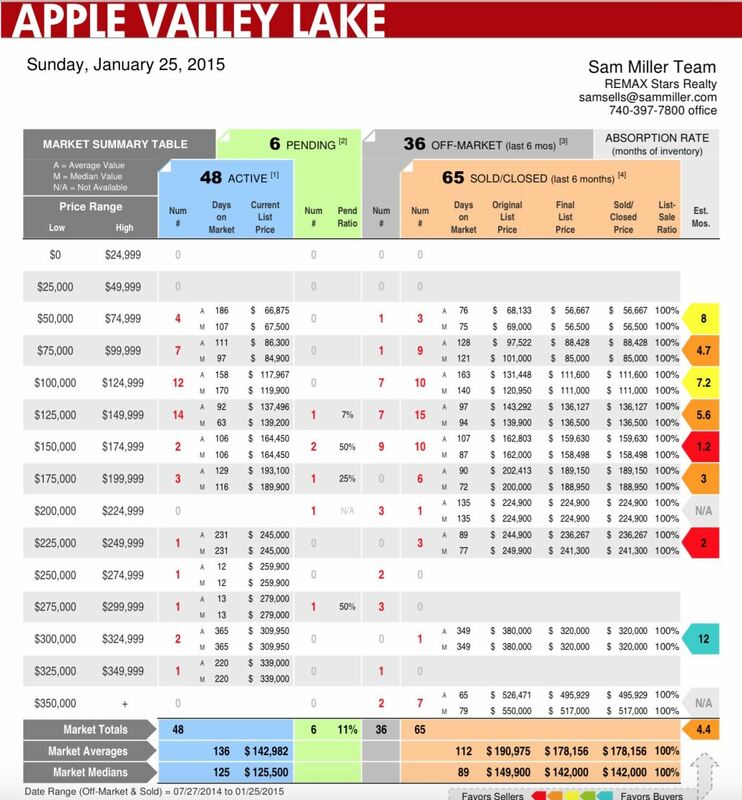 HOTTEST PRICE RANGE: Look at the $150,000 to $174,999 price range and you will notice that it is highlighted in red and this means there have been strong sales in this range and there are currently fewer homes available which makes these homes in demand (more buyers than sellers). LEAST ACTIVE PRICE RANGE: If you look at the $300,000 to $324,999 price range you are sure to notice that this price range is experiencing the exact opposite and this price range is fairly flat today. There is currently an 1 year supply of available homes in the $300,000 to $324,999 price range based on the sales activity during the last 6 months. Take a look at the specific column that most closely matches your desired price range for an Apple Valley Lake home. This detailed report offers you an insiders view of the Apple Valley Lake housing market. Our team would love to answer any questions you might have about the Apple Valley Lake housing market so feel free to call or email us at anytime. 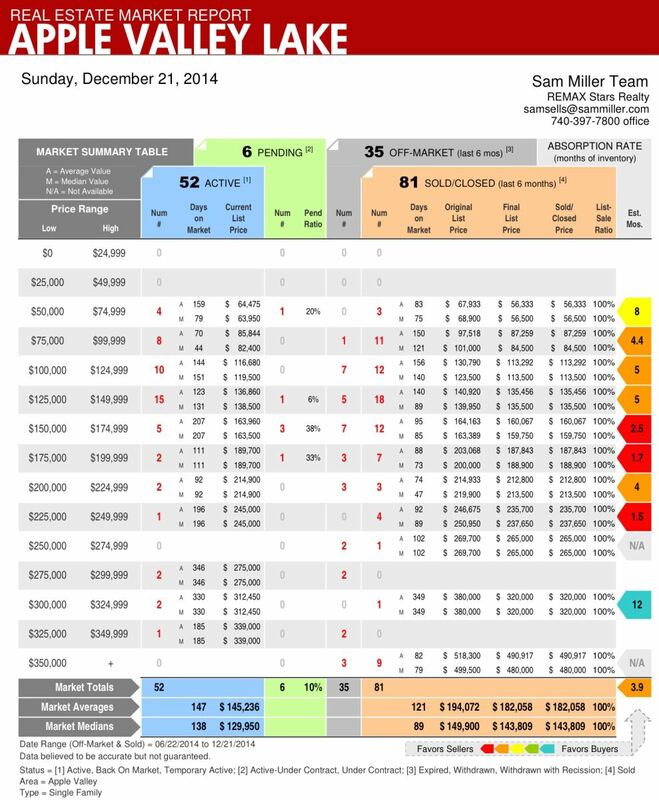 The Apple Valley Lake home real estate report for December 21st, 2014. During the past 6 months there have been 81 Apple Valley Lake homes SOLD ranging in price from $52,000 to $552,500. There are 52 homes at the Apple Valley Lake actively for sale plus there are 6 homes that are under contract. Home sales at the Apple Valley Lake remain very active and the median sales price is on the rise. During the month of August we saw the highest median sales price during the last 6 months which is a positive indicator that the Apple Valley housing market is strengthening. Home values at the Apple Valley Lake are still very affordable and we have an impressive selection of homes ranging in price from $69,000 to $100,000 and the majority of available homes are listed between the $100,000 and $200,000 price range. You can buy a waterfront home starting at about $300,000 and the highest Apple Valley lakefront home available today is listed for $759,000. You can view and compare all of our available Apple Valley Lake homes for sale and we have also created a specialized link that features all of our available lots for sale at the Apple Valley Lake. 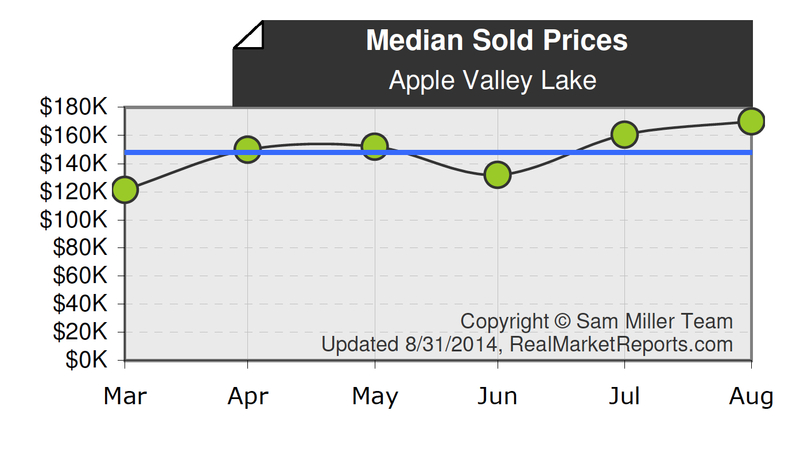 Apple Valley Lake housing market update as reported through August 10th, 2014. The market has been experiencing a nice increase in buyer and seller activity. Currently there are 16 Apple Valley Lake home sales being reported to the Knox County MLS and there have been 67 Apple Valley Lake homes that have sold between January 1st, 2014 and August 14th, 2014. As of today, there are 84 homes for sale at the lake and the average listing price is $174,950 with the lowest listing price of $72,000 and the highest at $759,000 for an amazing Apple Valley lakefront home. You can view and compare all of our available Apple Valley Lake homes for sale in price order by clicking this link. We have also created a specialized listing link that features all of our Apple Valley Lake lots for sale ranging from the least expensive lots all the way to the lakefront lots with water frontage on the Apple Valley Lake.